Nissan Leaf is a hatchback electric car introduced by the company in December, 2010. It's one of the best selling all-electric highway-capable cars that produces no pollution or green house emission. It has also won a number of awards and recognition from 2010 on. The Leaf is powered by a 24 KW-hour Lithium ion battery that can generate a power output of more than 90 KW. The car's electric motor delivers 107 horsepower. The company claims a maximum driving range of about 100 miles. The car's battery can be recharged fully in about 20 hours with a Level 1 traditional 120 volt outlet. However, it takes only 8 hours to fully charge, if done at a 240 volt charging station. A level 3 480-DC port is also available in a model which allows the battery to charge 80 percent of its total capacity in just 30 minutes. 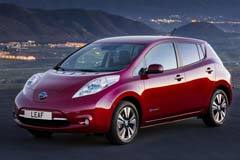 The used Nissan Leaf is one of the best option for customers who are looking for a car that is easy to drive and environmentally friendly. 2012 Nissan Leaf SV 2012 Nissan Leaf SV NO RESERVE!